Wild File Q&A: Why do turtles spread their legs and feet out when they rest on logs? Q: Why do turtles spread their legs and feet out when they rest on logs? 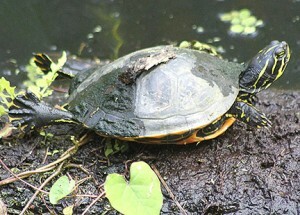 A Red-bellied Turtle basks in Bird Rookery Swamp. A: Turtles are cold-blooded animals, so they cannot control their body temperature internally. The only way they have to raise their body temperature is to bask to absorb warmth and vital UV rays. While heat is radiated to their bodies from their shells, they often stretch out their legs to collect additional heat. Usually, their feet completely widen out at the same time to increase the surface area even more. They are able to engage in thermoregulation and their metabolism functions become elevated. As a result, the efficiency of their immune and digestive systems increases. Another benefit is that they absorb important UVB rays in sunlight. UVB rays become metabolized into vitamin D3 which is necessary to process calcium. 2 Responses to "Wild File Q&A: Why do turtles spread their legs and feet out when they rest on logs?" Unfortunately, Mr. Brewer’s response uses several misconceptions about reptiles. They are not cold-blooded. A basking turtle can have a higher body temperature than a human. They positively can control their body temperature internally. Tetrapods are generally able to shunt blood to and away from limbs as needed to move heat to or away from the body core. They are not at the mercy of their environment as most people would like you to believe. Muscular heat and heat from the chemical bond breaking during digestion generate heat as well. So basking is not the only way to raise their body temperature. Their shell and body are functionally one in the same. To treat them separately reinforces the misconception about turtles being able to be removed from their shell and still be alive. Generally the rest of the response is spot on, although collecting UVB radiation is not the purpose of increasing the surface area during basking.